Brighton Friends’ Meeting House in Ship Street is hosting a major exhibition of ‘Quaker Service in a time of War’, commemorating the many local Quakers who served their country as Conscientious Objectors during the 1914-18 World War. 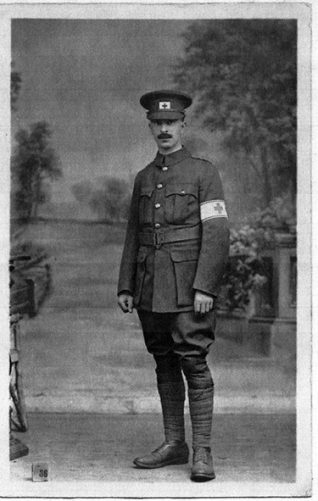 Leonard Devereux, who lived in Prestonville Road and whose photograph is shown here, objected to military service on religious and conscientious grounds. Conscientious Objectors had to face an often hostile Tribunal in order to be allowed to serve their country in other ways. Leonard joined the Friends Ambulance Unit from 1915, and after first aid and ambulance training served for the rest of the war on ambulance trains, keeping a vivid diary of his experiences. The exhibition ‘Quaker Service in a Time of War’ is currently open from 10am till 4pm at the Friends Meeting House in Ship Street until 24th July (except Sundays). All are welcome, and admission is free.